Topographies dazzles our eyes and walls with a trompe l’oeil effect that successfully tricks our senses—the seemingly three-dimensional surface is deceptively flat. To create the pattern, designers stacked multiple sheets of paper and tore away portions of the surface by hand, forming canyon-like valleys of various widths and depths. The wallcovering’s name refers to the study and survey of land reliefs, and the design depicts the intricate reliefs of a land of torn paper. To translate this formation to a vinyl wallcovering, designers photographed the torn paper landscape and then produced a digitally printed wallpaper that captures the depth and shadows of the original design. The wallcovering is the result of a collaboration between Snarkitecture, a studio involved in designing large-scale projects, installations and objects, and Calico Wallpaper, a designer and manufacturer of wallpapers. Topographies equally reflects both companies’ design interests: Snarkitecture’s work focuses on the reinterpretation of everyday materials like paper and wallcoverings in order to emphasize the importance of experience, while Calico aims to raise wallpaper to the status of art through their original use of paper and style to create depth and movement. The partners created an unexpected and memorable surface inviting people to pay attention to walls, transforming them into key visual and decorative elements. Wall treatments have the ability to extend our experience of an environment. 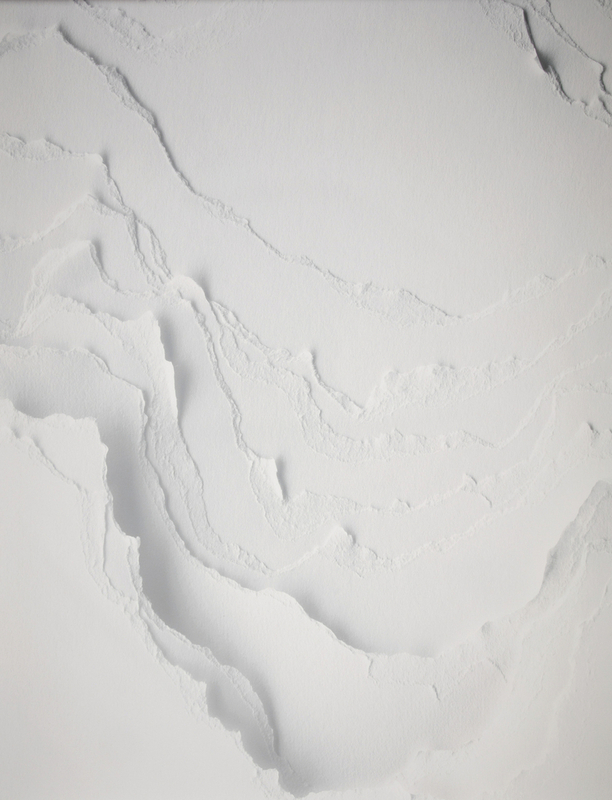 Here, Topographies opens up walls to a refreshing and invigorating three-dimensional landscape resembling a winter terrain blanketed with a soft coat of snow. A version of Topographies is included in the exhibition The Senses: Design Beyond Vision, on view at Cooper Hewitt, Smithsonian Design Museum through October 28, 2018. Adèle Bourbonne is a curatorial capstone fellow for The Senses: Design Beyond Vision. She is an MA candidate in the History of Design and Curatorial Studies program offered at Parsons The New School of Design jointly with Cooper Hewitt, Smithsonian Design Museum.